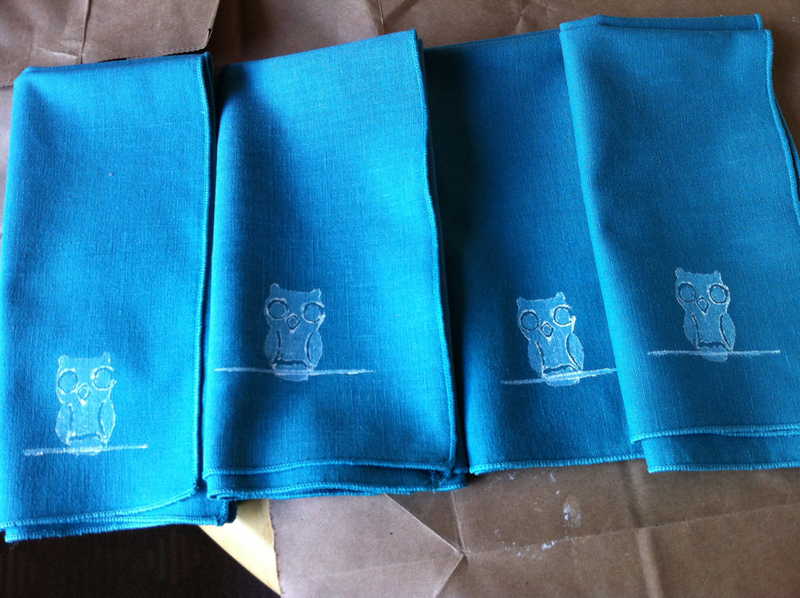 A few years ago, I got it in my head that I’d hand-print napkins for Christmas presents (despite my dismal crafting track record). I enrolled my friend Katie and we cleaned the Seattle Goodwill out of every natural-fiber napkin they had (about 60 if I remember correctly). 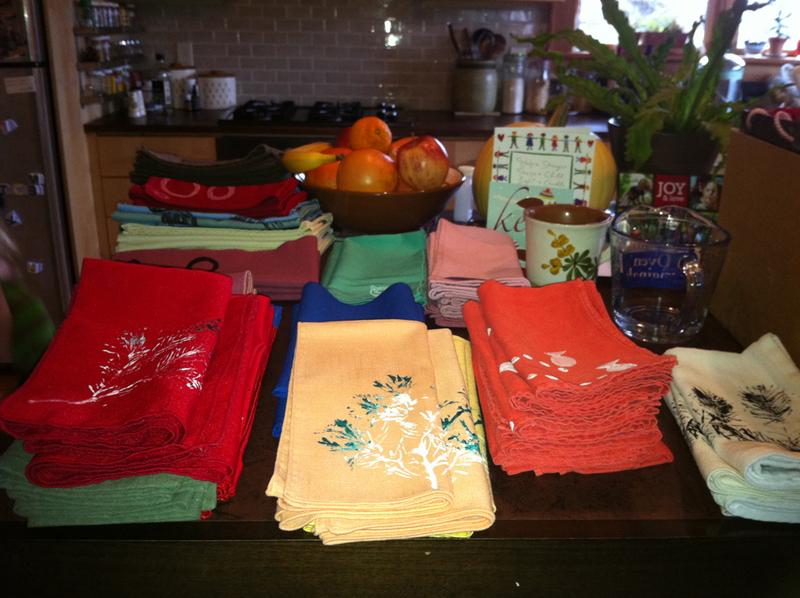 It took several sessions to brainstorm and practice our approach, print the napkins, and then finish them with 60 seconds under a hot iron, but the results were charming, thoughtful, and well-received gifts. The printing project that started it all. 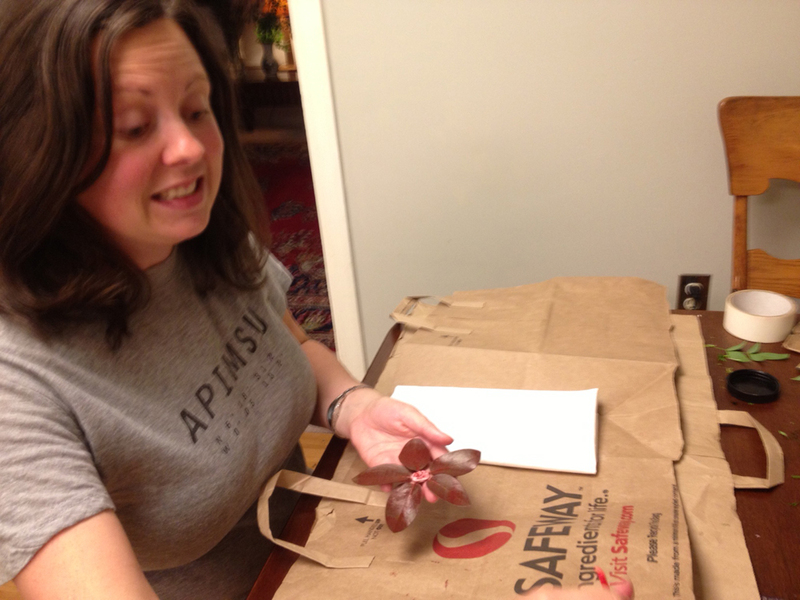 We did napkins, but there’s pretty much nothing you can’t print on – it even works on synthetics. These prints wash beautifully over and over again, and the ink or paint is inexpensive and non-toxic. 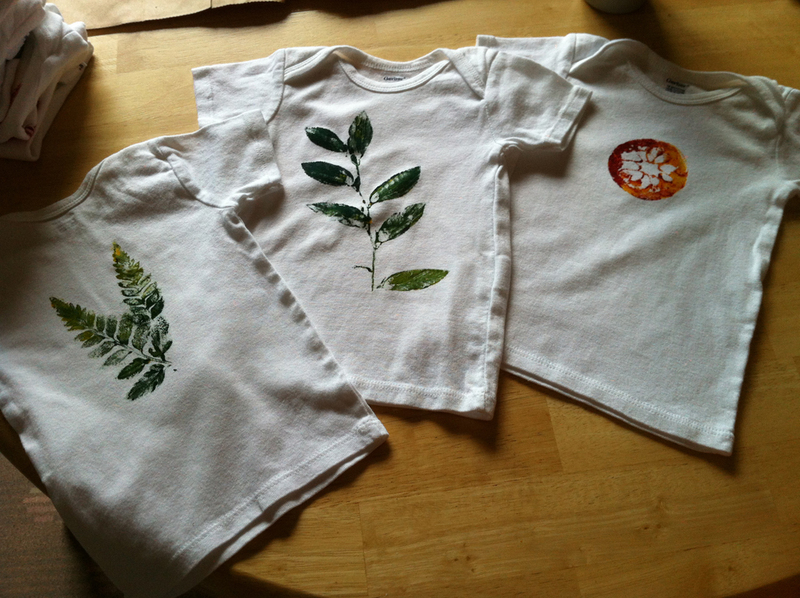 Two-tone nature stamps for a baby gift. The red and yellow circle is a lemon. It works best with an older lemon or one that has dried out overnight; this gives it more definition, and the acidic juice from a wet lemon turns the ink brown. I recently recruited Caitlin to print with me. 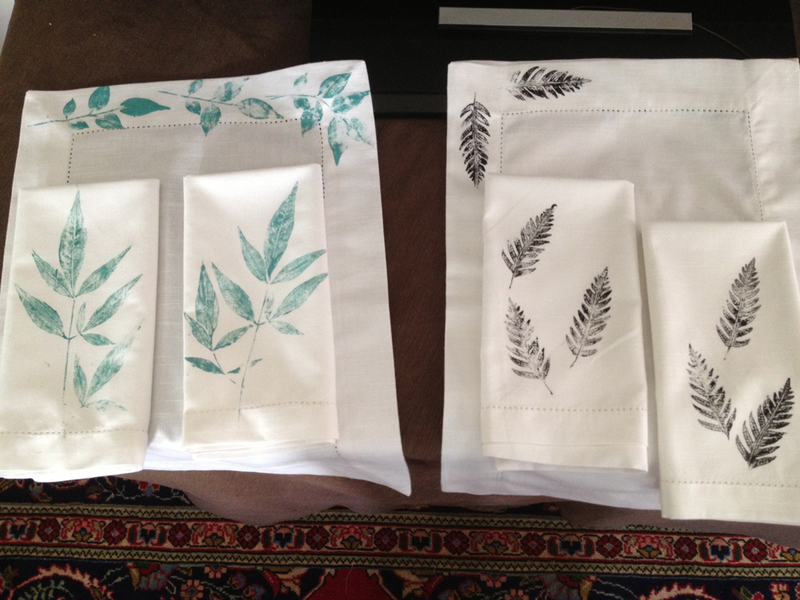 We both have weddings coming up, so I got us some lovely white hemstitch napkins, place mats (or tea towels if the recipient prefers), and table runners – perfect wedding gifts and great printing candidates. I prefer nature prints for their ease and beauty. Caitlin and I went on a nature walk to gather materials and spent some time experimenting with colors and prints (not everything stamps well, like the long grass I tried so hard to make work). 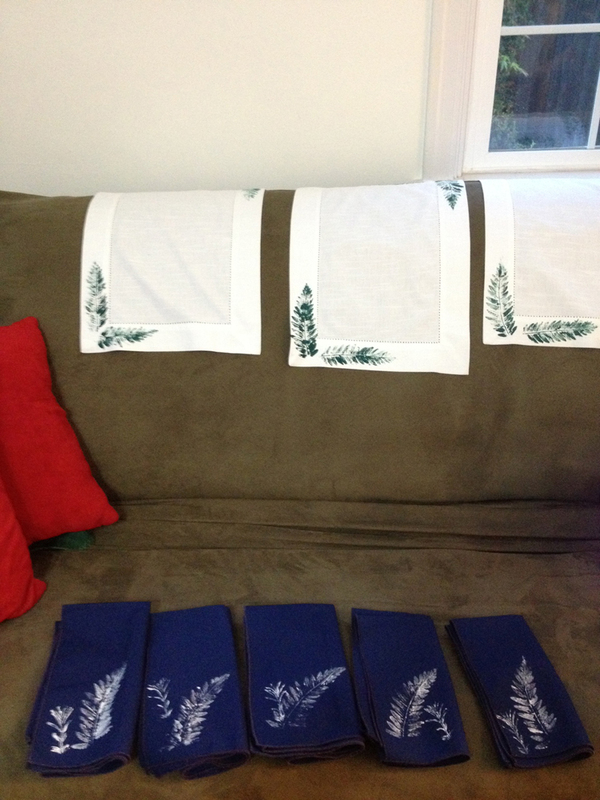 Soon, Caitlin started on a set of “practice” napkins (five navy blue linen napkins that Carson found at the Hospice thrift store down the street for a buck). Her napkins were lovely and it wasn’t long before she moved on to the whites. 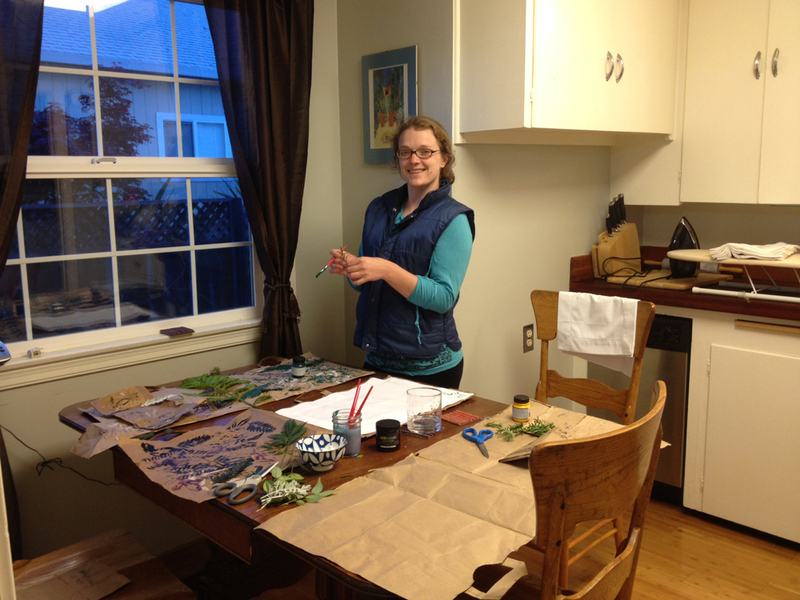 Caitlin’s first printing experience was a resounding success! Caitlin had a theme – two plants that represented the bride and groom (so personal and thoughtful). Not knowing what plants represented my couples, I was just looking for pretty motifs. I especially love the teal leaf patterns and very seriously considered keeping them for myself. Teal leaves and black ferns. Interested? Here’s how to do your own hand printing. 1) Pick out your materials. You can print on literally anything that can be ironed. I recommend ironing them first so you don’t print over any wrinkles. 2) Buy textile or fabric ink or paint. I use both Jacquard textile paint and Versatex screen printing ink. (Note: the “ink” is the right consistency, but if you buy paint you’ll need to mix it with a little water. It should be fairly runny.) I have a few colors that I mix together to make other shades. You will also want some paintbrushes (they don’t have to be fancy). 3) Gather your “stamps.” You can carve anything into a potato, but make sure the relief is fairly deep or else the stamp won’t come out clearly. I prefer nature stamps. Ferns work very well. In general, the more firm a plant is, the better it will print. You can use the same nature stamp about 10 times before you need a new one. You can also paint directly on the fabric, but I’m not quite that talented. 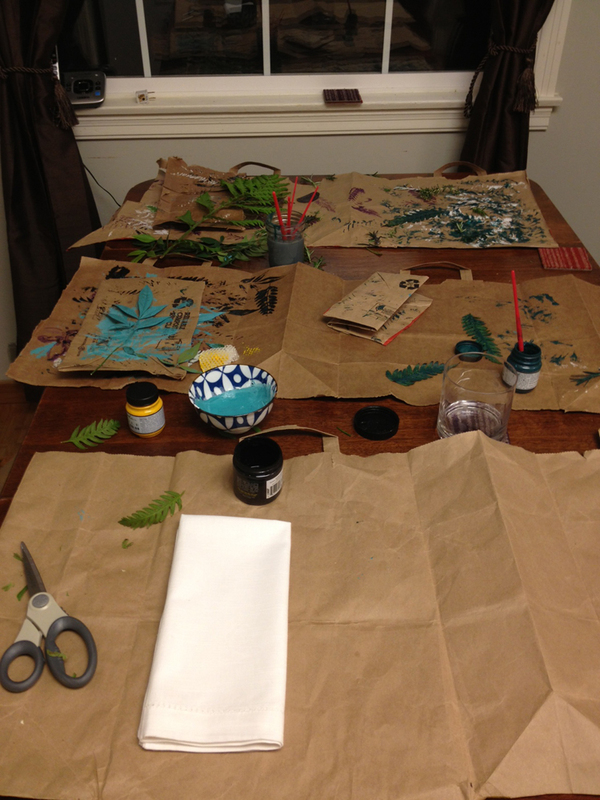 4) Cover your workspace with brown paper (I cut open bags). This is both your table protector and your practice area. Paper doesn’t print exactly like fabric, but if it looks good on paper it’ll definitely look good on fabric. Paint a thin layer of paint on your stamp (you can get creative with two-tone stamps), gently set it on the paper, and then press down firmly on top of it with another piece of paper (so you don’t get any potential paint from your fingers on the stamp area). If you’re using a potato, just press down firmly. You might consider blotting the stamp a little first before doing the actual printing; I personally think prints with less paint look nicer. 5) Once you’re satisfied with your paper prints, put fresh paper down and start stamping the fabric! Once stamped, lay it somewhere to dry. To finish, iron over the now-dry stamped area for 60 seconds (I avoid burning it by constantly moving the iron over the area). VOILA! I have only ever had to do this once, BUT if you find that your stamp is awful, you can quickly wash it out with cold water and soap, let it dry, iron it, and try again. Stamping a “flower” crafted out of leaves taped together. If this seems complicated or you have questions, please ask me! Bear in mind that I am not a particularly crafty person, but I’ve never made a print that wasn’t cool (though some are undeniably cooler than others).